The name Balbir has a glorious record in Indian hockey. 6 Balbir Singhs did duty for India, playing in 4 Olympics (3 Golds, 3 Bronzes) and 3 Asiads (3 Golds, 4 Silvers). All 3 Olympic gold medals were won by one person - Balbir Singh Sr. (Punjab Police). All 3 Asian Games gold were won in one Asiad (1966 - Bangkok). The six Balbir Singhs include Balbir Singh Sr. (Punjab Police) - 1948, 1952, 1956 Olympics (Gold), 1958 Asiad (Silver), Balbir Singh Jr. (Punjab) - 1958 Asiad (Silver), Balbir Singh (Punjab Police) - 1968 Olympics (Bronze), 1966 Asiad (Gold), Col. Balbir Singh Kular (Services) - 1968 Olympics (Bronze), 1966, 1970 Asiad (Gold, Silver), Balbir Singh (Western Railway) - 1968 Olympics (Bronze), 1966, 1970 Asiad (Gold, Silver) and Balbir Singh (Navy). 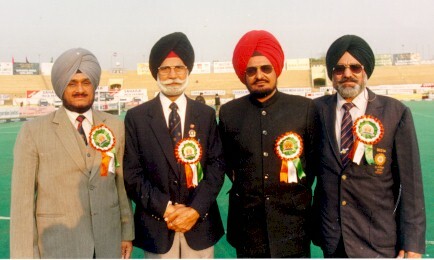 The photograph below, taken in 1995, shows 4 Balbir Singhs who brought glory to India.